A classic from the Golden Age of Image Comics, collected in trade paperback for the first time! Pagan imagery and early Christianity clash across time in Matt Hawkins' acclaimed tale of medieval mayhem and transtemporal quests! In 541 AD, Guinevere, widow of King Arthur, attempts to unite the Britons under the banner of Excalibur and the Goddess. In 1999, her descendant, Jennifer Drake, unravels a mystery that could end the world - unless she claims her birthright, and the sword Caliburn. Guinevere faces traitors on all sides, and Jennifer battles the wicked Mordred and Morgana - can the righteousness of any god or goddess triumph over evil? COLLECTS LADY PENDRAGON VOL. 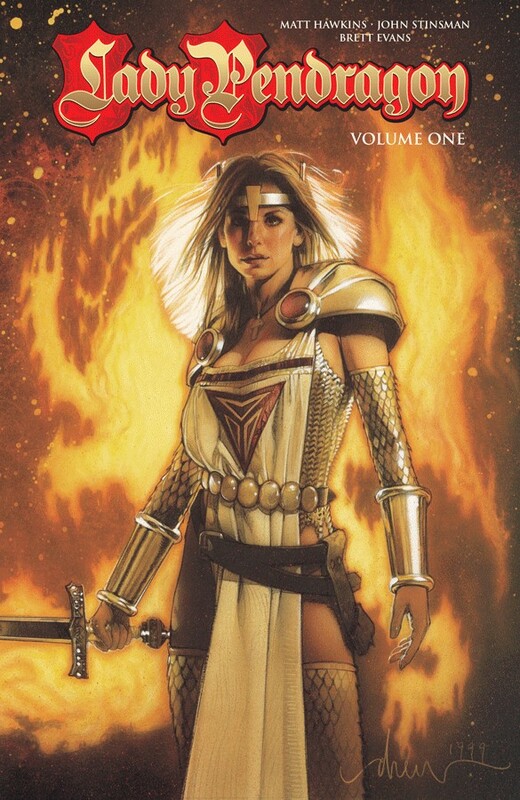 1 #1, LADY PENDRAGON VOL. 2 #0-3, AND COVER GALLERY.